High hopes have come, gone and been replaces by smaller ones. 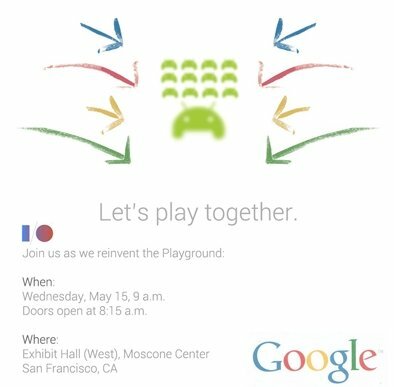 Finally, we have a clearer picture of what's going to be announced this upcoming Wednesday at Google I/O. I have gathered all the rumors just for you, dear reader. It didn't help assuage my skepticism, but at least we won't get our collective hopes up. The great big hope was certainly the reveal of the Nexus 5. At the beginning of March, a mock-up leaked of what appeared to the Nexus 4's successor. Of course, it was a bit premature, as the predecessor had just come out in November. As Feist says, let it die. This just ain't happening. Then came rumors of the Motorola X phone. The device haunted the internet, showing up week after week as a phantom device in numerous tests. Just today, we found out that the X Phone is under review by the FCC. Yay! Except, it's not expected before July. So no yay. At the end of April, we received an in-house roadmap from Samsung with all the company's tablet release dates. Here we first learned about the existence of the Nexus 11, the first tablet with an 8-core processor. However, the device has not been conformed by Google and the facts on the ground are thin and, thus, I don't think it'll be making an appearance at Google I/O this Wednesday. We're pretty sure Google is going to present an update to their Nexus 7 at I/O. This is based on data from an industry analyst. Strange: according to the analyst, the Nexus 7 will feature a bigger and better display and a smaller battery. I want to believe this, but I'm not totally on board. But that Google will present a technically-improved successor to the original Nexus 7 is likely. I still wouldn't bet my grandma's wooden leg on it. It would work so well: a new Nexus 5 and Android 5.0 Key Lime Pie. Ta-daaa! Except no, to both. There's just no evidence Google is going to release anything like Android 5.0. Instead, we're expecting a "small update" to Android 4.3. Maybe if we're lucky, some of Nico's dreamed-of Key Lime Pie features will be implemented in Jelly Bean 4.3. First it was called Google Bable, then Google Babel, and now we're hearing a lot about Google Hangouts making an appearance at I/O. Whatever it is, it's likely to be a unified messaging service that works across different Google services (like Google+, Talk, Drive, etc.) We'll be surprised if something like this isn't revealed. Game Center: The Biggest Reveal of All? Game Center is expected to be the big reveal of the conference, based on an invitation published online which reads, "let's play together." We've been reporting on little snippets about Google's Game Center and now its existence is a fact, not a rumor. Its reveal is a pretty sure bet. The once great hopes for I/O, with a few important exceptions, have mainly disappeared. I honestly do not want to let Google be my primary source of inspiration, so I'm okay though. In terms of hardware, we can't expect too much, which is too bad since last year brought Google Glass's big reveal. Whatever revelation occurs, it will probably relate to online gaming (an important future market), as well as unified messaging. Whether Google can actually surprise us, I'm quite skeptical. But I'm hoping for the best. Are you convinced I'm wrong? Or are you, too, girding yourself for a rather unspectacular developer's conference?